At C&E, we enjoy sharing information about products that make a difference. 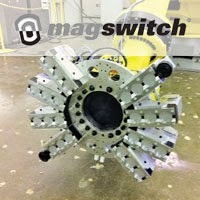 Magswitch automation tools have a long lifetime with minimal maintenance and downtime while offering high duty cycles, fact actuation, and Class A surface handing capability. In light of the reliable automation support Magswitch products provide, on April 9, 2015, we will be hosting a Magswitch webinar that will be complimentary to the public. In the course of an hour, our technician will take you through the below topics in order for you to make the most of your automation goals when using Magswitch products.